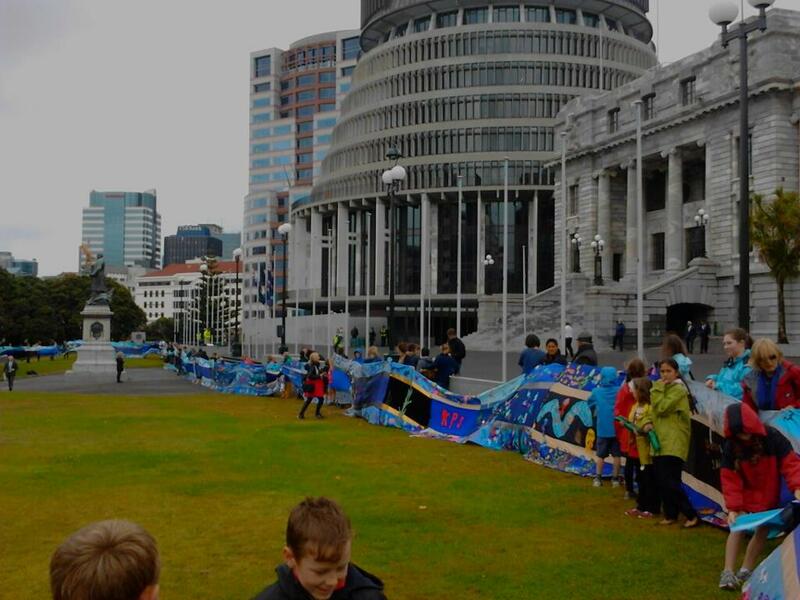 The Tuna Tapestry is STILL getting around New Zealand…amazing! Here she is being viewed at the recent EcoWest Festival at Auckland’s Olympic Park last month. Sweet as! 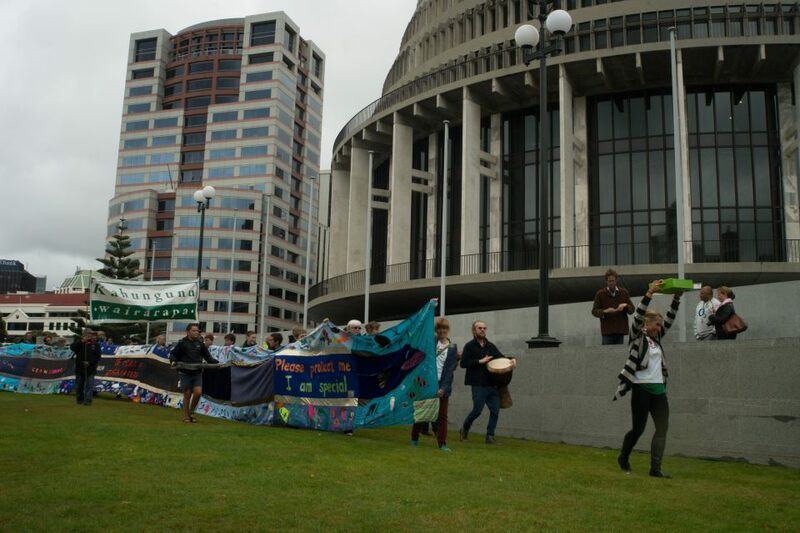 It was a wild, rainy, cold, and windy day in Wellington…… just perfect for eels, but not so for the average person planning to protest and deliver a petition on the forecourt of New Zealand’s Parliament. Fortunately, my tuna whanau is not made up of average people. 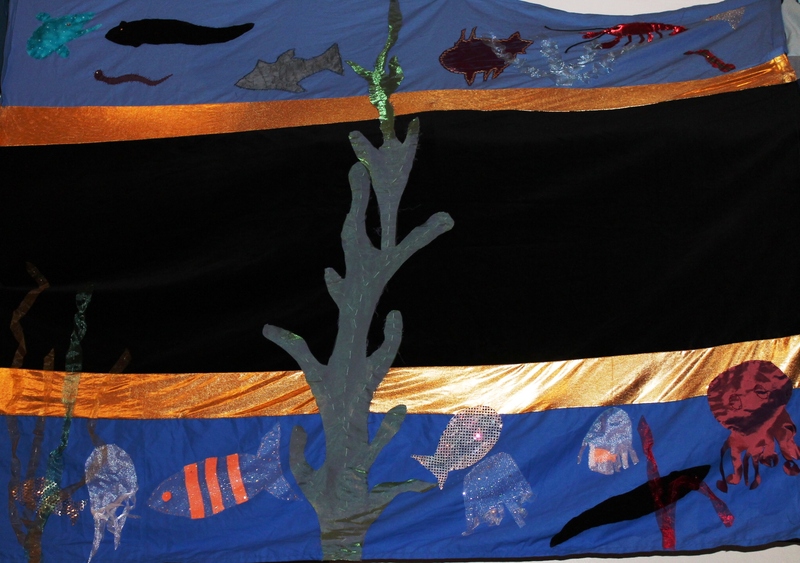 Over 150 folks from all over the country showed up to carry our 150 metre long Tuna Tapestry….. about twice as many as I had hoped for even with the expected sunny weather! It was an incredible experience to dance to the music of a marching Bella Cajon and lead the tuna and all her supporters as we s-curved our way to the steps of Parliament and presented the petition calling for a moratorium to be placed on the commercial fishing of the longfin eel. 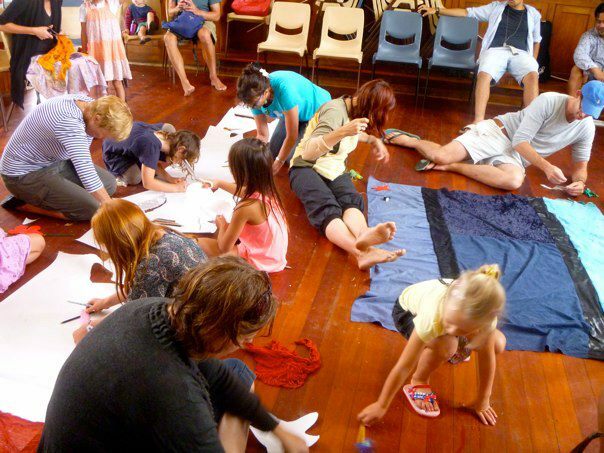 Our voices may have been a bit nervous and shaky at times as we spoke, and the tapsetry almost became a giant tuna kite with Careew Peel Forest kids and Wairarapa kids attached, but we did it. After I, Mike Joy, Caleb Royal, and Sam Ludden spoke the petition was given to Eugenie Sage and she rushed it into the building to immediately present on the floor. Steffan Browing (another Green MP along with Eugenie) is now part of the Parliamentary committee who is reviewing the scientific support for the petition…. so, all our fingers are crossed as we wait. Finally, we are given extra hope after the Parliamentary Commissioner for the Environment released this report on the longfin. It sends a very strong message in support of the moratorium and we are all very excited! 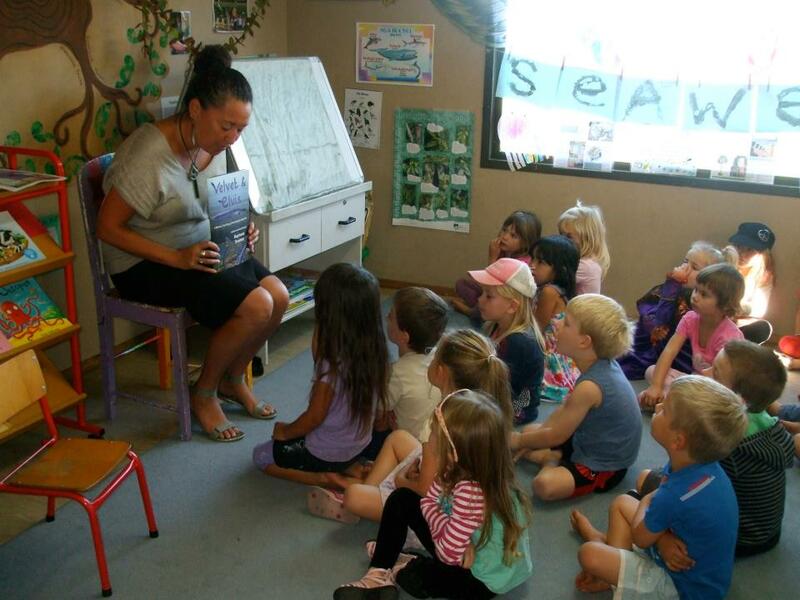 There is so much more to share, including the fact that Velvet & Elvis, my childrens’ eel book finally exists and is being read now by kids all over NZ and beyond! 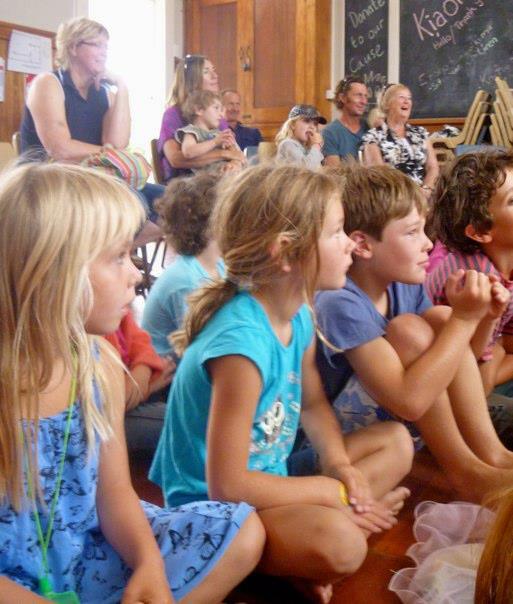 And there were quite a few great reports on our march in March, including this one on Radio NZ in which the Careew Peel Forest School kids are intgerviewed. And, be sure to check out this article in Element Magazine, as well as Nicki Wakefield’s video bit. Best of all, it was very powerful for all of us tuna lovers to get together and share our kinetic energy to make a difference even when the work days are long and we each feel like we are not getting anywhere. We now know who all the other people are who are joining us every day in fighting the good fight. Celebrating Tuna Roa on Waiheke Island! 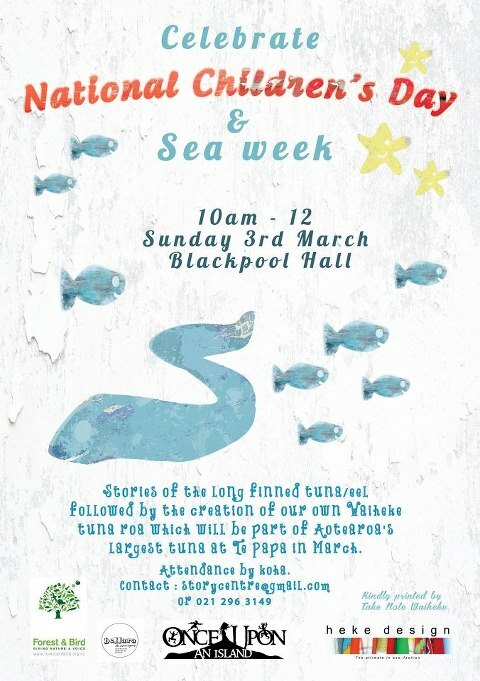 Today for National Children’s Day and Sea Week Tanya Batt and other Waiheke folks celebrated their native long finned eel/tuna through story and art. Danny Shortland, storyteller and carver and artist and cartoonist, Nooroa, shared the traditional Maori story of Tuna Roa – the father of all eels. 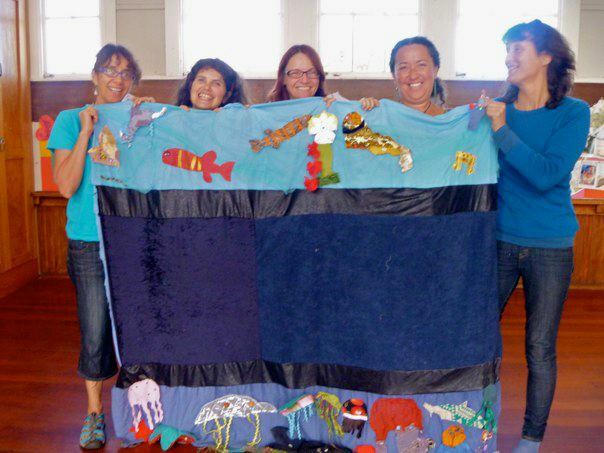 After sharing stories they all worked together to create the Waiheke Island panelfor the 200 metre fabric tapestry tuna nui who is swimming its way to parliment house on the 19th March to call an end to the commercial fishing of the long finned eel. What a fine, fun mess! A really special day of creating and sharing, doubly blessed by the tears of Rangi as the first rain in a month fell. A BIG mihi to Jacqueline Joseph of Forest and Bird Haurkai Islands, Bea Lorimer of Heke Designs, Danny Shortland and Nooroa for their time, talents and energy that made today possible. See ya’ll at Parliament!!! Jaguar at the Border Wall!!! 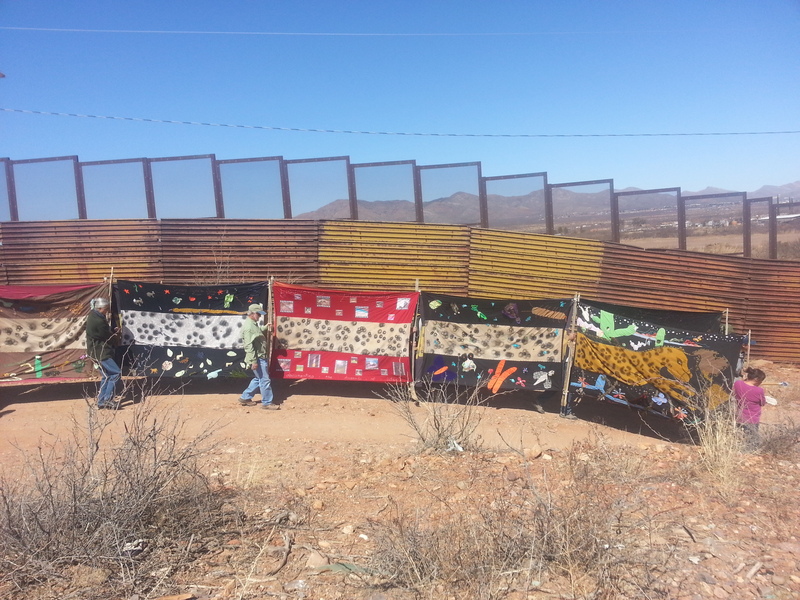 What an inspiring and invigorating day we had this past Thursday when John Davis, on his Trek West journey met Sewing Spots Together in Naco, Mexico to cross the border from Mexico to the United States. John is walking, biking and paddling from Hermosilla, Mexico all the way to Canada to bring attention for the need to connect our wild spaces with wild corridors so that species like the jaguar can roam and breed. We were joined by Yaqui shaman who blessed John’s journey into the US. The blessing gave us time to reflect on just why we do all the hard work we do for biodiversity. And, we were also joined by several Naco teachers and environmentalists from Naturalia. Together with folks from Defenders of Wildlife, Sky Island Alliance, and others we carried our beloved tapestry around town while the conch shells were sounded and folks came out onto the street to cheer us. We made our way to the border wall to visually highlight the problems created for wildlife by such barriers. 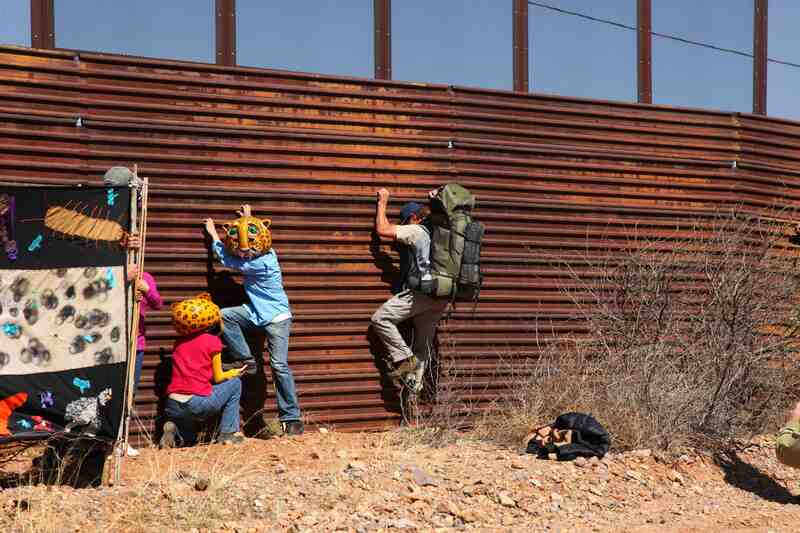 Thanks to Border Patrol cooperation and patience no one was shot at when John and El Tigre de Matt climbed the wall! Then, we carried ourselves and our jaguar back to Bisbee for beers and camaraderie. “Cheers” to John for making this journey for connecting wild places and people along the way! 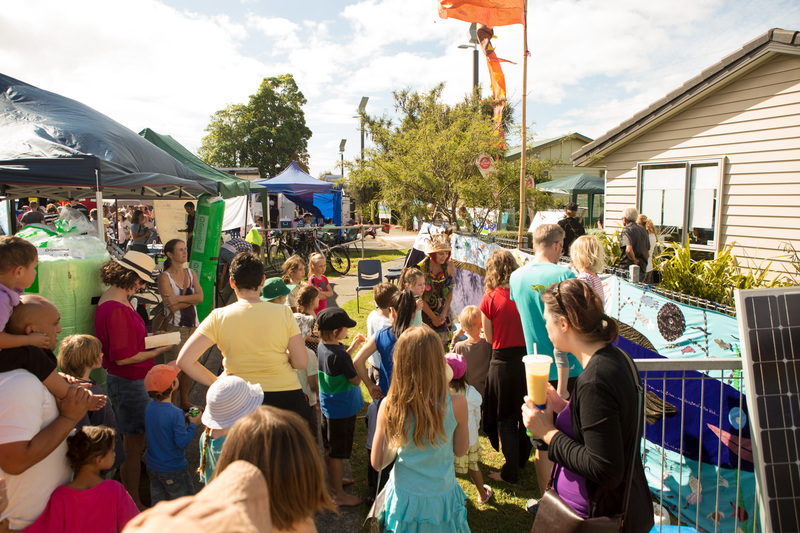 Waiheke & Wananga Folks Jump In! Just as we realized that Velvet had grown too big to be hung in her entirety at Te Papa this month, we got a shout from environmental scientist, Caleb Royal, in Otaki. He said that the Wananga community would like to display the bits of Velvet that couldn’t fit into Te Papa. And, these folks are making their own panel that Caleb will bring with the rest of the tapestry and lots of new petition signatures to Parliament on March 19! As soon as Caleb has a photo of this panel, we’ll post it here! Then, just before the opening blessing for the tapsetry at Te Papa, Jacqueline Joseph on Waiheke Island jumped in, saying that she and her fellow islanders (including Rob Morton and his daughter Tilde) would also like to get involved. Check out these photos from their event in an upcoming post! And, true to their island’s name, many of these Waiheke folks are planning to make the journey to Wellington to help carry our tuna to the steps of the beehive! Stay tuned for photos from these great folks! Some Mysterious Sightings of our Eel! Velvet has been rumored to have made two appearances for which we have no photos available. Many of you know The Jester House in the Tasman region as a place with a giant boot cottage and where tame eels writhe right out of the water to take food from your hands. Every spring Judy and Steve, the eel-loving owners of the famed cafe have an Eel Festival to welcome the eels back after the cold winter when they hide deep in the banks. This past September, among other eel activities they also had Velvet on display…. well, as much of her as they could as it it ended up raining buckets! We really enjoyed hosting Velvet unfortunately it rained all weekend and we were not able to display as much of her as possible. However what we could display looked fantastic and generated a lot of interest.We collected a lot of signatures on the petition. On the weekend of the Eel Festival we did lots of eel related activities which were enjoyed by many families despite the rain. There a photos posted on our facebook page that you can check out. Thanks for all you are doing for our wonderful eels. So, thanks to Jester House for hosting Velvet and celebrating this years’ eel return in spite of the weather! And, soon after she left the Tasman Velvet was seen by the folks of Timaru while she graced the walls of the South Canterbury Museum. Thanks to Philip Howe, the museum’s director, for sharing our eel and the eels story with folks around the region. Her name is ‘Burra’ which is the local Dharug word for Eel. She is a 15ft long turf sculpture (the photo only shows the front half). We hope that she will help to inspire children to learn about the longfin eel life cycle and how to protect her ocean and pond habitat. Pretty cool, huh? Thanks everyone for these mysterious eel sightings! Velvet’s Last Stop on the South Island! While most of “Velvet: The Travelling Tuna Tapestry” is resting and being mended by loving hands at her home lake of Rotoiti before she heads to Wellington for her trip to Te Papa and Parliament, 30 metres (including her head and tail) are currently on display at the North Otago Museum in Oamaru. Our old eel is still looking good at the end of her S. Is. heke. Thanks to Chloe Searle, curator for collections and exhibitions at the museum, and her crew, South Islanders are getting one last look at Velvet before she heads to Wellie in January. 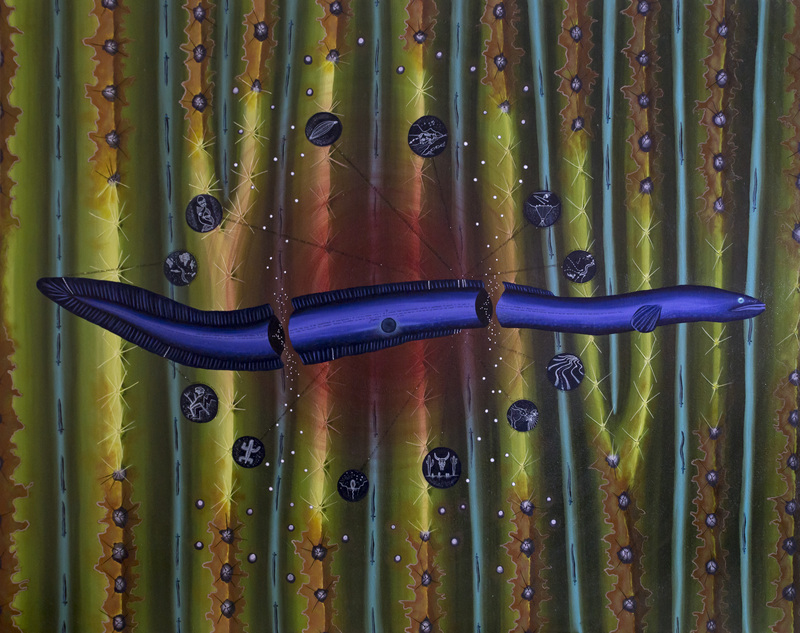 And, check out one of the newer panels here… lovely stylized images! 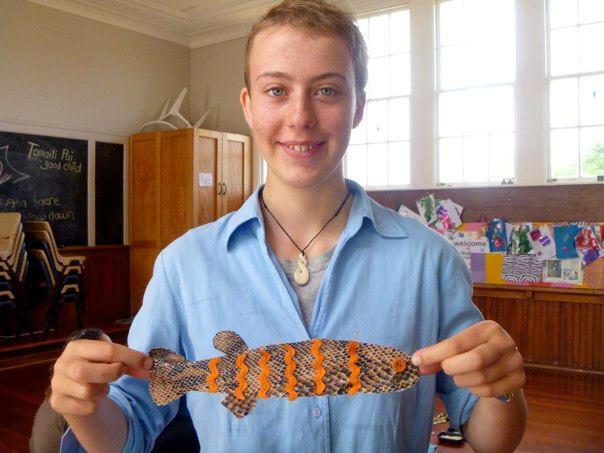 Chloe is also working with one of her museum volunteers and kids to make a new section for South Otago and here it is! Be sure to visit the museum’s FaceBook page.